In the darkness of night, a bright light pulses to help ships navigate their way safely home. Have you ever seen a lighthouse? Can you think of lights that help you find your way home? Built in 240 B.C., the Lighthouse at Alexandria on the island of Pharos was the tallest man made structure on earth, the first known lighthouse and one of the Seven Wonders of the World. During the day, mirrors reflected the suns rays and at night the lamp was lit by an open fire that guided sailors safely into the harbor. Lighthouses are found all over the world and while the mechanism of illumination has changed, the purpose of the beacon remains constant. Over the centuries the "lamp" - the term for the source of light - has been lit by various means, including wood fire, candles, electricity, and solar power. Lighthouses denote entry to a harbor and aid sailors in navigating treacherous coastlines, reefs and shoals. 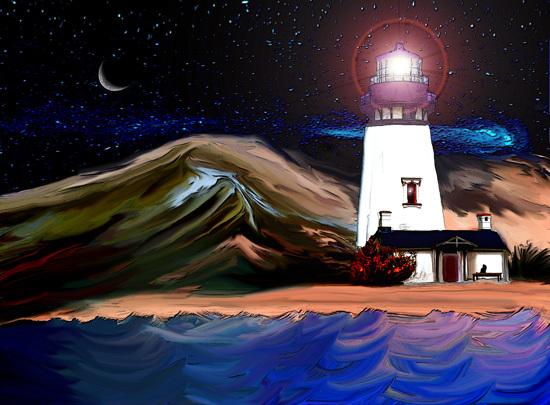 The use of color or painted patterns (day mark) and frequency of the lamp's flash (its night signature) indicate the lighthouse's geographic location. These distinct markings and flashes assist not only the ships' passage, but aerial navigation as well. Many lighthouses, perched in desolate and remote areas, required a constant human presence. The life of the lighthouse keepers was one of courage and duty, as precarious as the lives of the sailors who relied upon them to light the lamp. Over time and with advanced technology, the need for lighthouses has dimmed, still they remain a vital navigation tool. Lighthouses have a rich history, and organizations throughout the world work to preserve the legacy of these beautiful and historical landmarks.